Award-winning Boulder-based abstract artist returns his “Heart” to Steamboat. The night before the Super Bowl, Boulder-based artist Will Day found himself at a party in San Francisco hosted by Maxim magazine where he had been sponsored by Isplack to create a large-scale interactive painting—live. For the best search of Steamboat homes for sale visit www.FindHomesInSteamboat.com. It was a fundraiser, a celebrity-studded affair, a big pre-game blowout hosted by a magazine known for covering trend setting, A-listers, and supermodels. 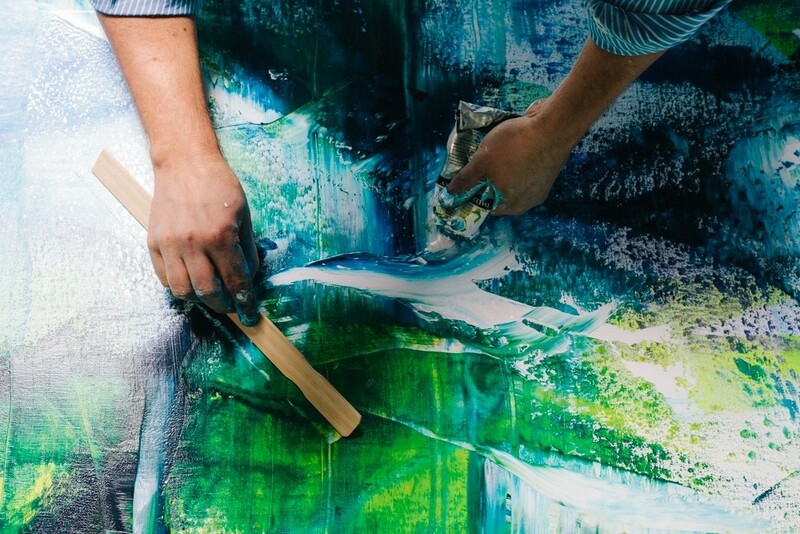 For Will Day, an award-winning abstract painter who is known for creating large-scale abstract paintings in live settings, it was just another day at the office. “It’s about not being hidden in a corner but playing off the vibe and the energy of the people around me. It’s that human involvement and emotion and letting people into the world of creativity. That’s what the art is all about,” Day says. The result was “Clash50” a six-foot by six-foot oil-on-canvas painting with a kinetic, graffiti inspired menagerie of bold color and movement that achieves Day’s goal to “tell a story.” Because of that approach, each one of his paintings is unique, dictated by a moment in time rather than an overarching style or technique that defines most artists. “Every painting has a story that’s already been created. It’s up to me to direct it, and find those moments of inspiration,” he says. Day uses everything from acrylic and oils to spray paint, harnessing tools he acquired though his architectural training. “I love painting on the floor and moving my canvas so I can come at it from all angles,” he says. It’s not surprising that Day’s paintings are somewhat unconventional. He did not arrive into the art world on a straightforward trajectory. After college he entered the Peace Corps. Then he worked on Wall Street in finance. Then he got his masters degree in architecture. Then he moved his wife and two kids to Los Angles to work for a top architecture firm only to throw in the towel and then randomly move to Boulder where he’d finally answer a calling to paint. He got his first big break with a show at the K.Saari Gallery in Steamboat Springs and things took off from there. Day put his business savvy, his live-wire personality and his ambition to good use. He wrote a business plan. He asked his wife for two years to prove he could make it as an artist. He leased his art to big businesses in Boulder who needed to furnish empty office buildings. He networked. He found a niche doing commission based and live-performance work. Today he was commissioned for a project with Absolut Elix vodka to create a piece with the Denver-based non-profit Water for People that will be blown up to 50-feet and projected onto the side of a building in downtown Denver. He’s also been commissioned to create a 28-foot canvas as the centerpiece for Blackbelly Market, Top Chef winner Hosea Rosenberg’s new restaurant in Boulder. And he’s also coming full circle to Steamboat Spring where he first got his start at the K.Saari Gallery by exhibiting his work, “Heart” (4’ x 4’ oil on wood panel) at Steamboat Sotheby’s International Realty’s main office (where, incidentally, Kimberly Saari, the former owner of K.Saari art gallery now works as an associate broker). “It was a very important piece for me,” Day says. It was his first horizon landscape piece, the first time he used different architectural tools like edges and squeegees and different materials like varnish. “It was a new discovery.” Some might even say it was a work where he discovered his heart, and now it’s coming back home.